Most Thrivecart reviews are trying to sell you Thrive Cart in order to make a commission… Because that's their only business. This is kinda shady and results in you getting PUSHED towards software that may not be perfect for you. The goal of this post is to help you understand ThriveCart (and the other options) better so you can make an intelligent decision whether it's the right tool for you. Full disclosure: Yes I'm an affiliate… But I have two wildly successful businesses (that run on Thrive) and I'm not here to make commissions. My goal here is to help you avoid disaster and get started with the correct foundation from day one. You see, if you get started on the wrong shopping cart and have to migrate a running membership program to a new shopping cart later, that is an absolute disaster! You can lose subscriptions, you can lose months of time and energy… And ultimately you will lose customers. 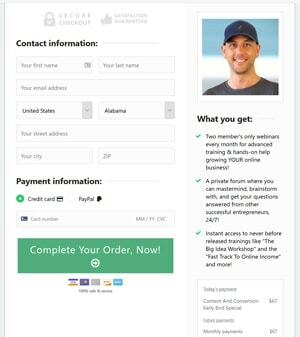 I found Thrive Cart after ClickFunnels began dropping member payments while still giving members access. After Click Funnels lost over $10,000 of my money it was time to move. Thrive Cart and Sam Cart were the two shopping carts I considered for my Clickfunnels alternative when it was time to change. Must be BULLET PROOF with the ability to handle thousands of transactions per year. These requirements pointed to two possible options which you'll learn about next. I had already been using SamCart on my wife's main website and we've generated over $739,578.15 in revenue through that shopping cart. For my full SamCart review, click here. The additional expense does offer you additional functionality that advanced marketers will want. This means you can run A/B split tests on your checkout pages! Your checkout page is one of the most important conversion points on your website. The ability to split test checkout pages on SamCart can more than cover the additional costs. Plus, you can build out '1 page funnels' on SamCart which are CRUSHING IT in many niches right now… And you simply can't do this on Thrive. The flat fee on TC and annual savings of hundreds if not thousands of dollars may be more important to you, at this point. Right now, Thrive cart is offering a lifetime license for a 1 time fee of $595. On SamCart's basic option ($99/mo with no affiliate module) you end up paying over $590 more in the first year and then about $1200 more each additional year compared to Thrive. If you have a high volume business that generates hundreds of sales per month, your ability to split test checkout pages on Sam Cart will likely allow you to make 5x to 10x more than the cost back each year. This has proven true for me which is why I'm still on Sam Cart for my one-off product offerings and Facebook PPC funnels. When Is Thrive Cart Better Than ClickFunnels & SamCart? This is the ultimate question: When is ThriveCart the best option for your online business? The simple answer is: Membership sites! This is not to say that Thrive cart doesn't work well with physical products, for Shopify stores, one-off digital products, coaching, free plus shipping, etc. But Thrive cart is one of the easiest shopping carts to build out a successful membership program on. And membership programs are the holy grail of recurring income! 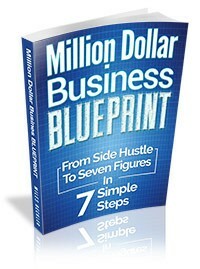 I teach a specific membership funnel that I've used to create multiple six figure online businesses. Thrive cart's system works perfect with this funnel and the default checkout pages and upsell pages convert great in this scenario. My Six Figure Membership Funnel! After the user checks out, you offer an annual upsell at a steep discount. I can tell you firsthand that it is way easier to build and manage this funnel and the customers' subscriptions on Thrive cart. Since Thrive is a standalone shopping cart you still need some sort of a membership module, or plug-in that will receive the payment information and deliver access to your customer. But if you are wanting to set up a membership program, ThriveCart is a great option. On the two membership programs I run, we use Thrive cart on both. If that is just too much for you to handle at this point, but you still need a solid shopping cart, I recommend you check out that eStore plugin that is also a 1 time fixed fee. Click here to learn about the eStore plugin. This is the first shopping cart I started with many years ago. It is extremely simple, has very few bells and whistles, but it WORKS! The developers are very responsive, still update it and it is a cheap, flat fee option. If that's the case, just click here and get Thrive Cart now. For a long time Thrive cart was actually the number one leader in integrations out of any shopping cart solution. Their direct tag based integrations work amazingly well with marketing automation solutions like ActiveCampaign, Ontraport, Infusionsoft, etc. ClickFunnels is not even a contender in this area! 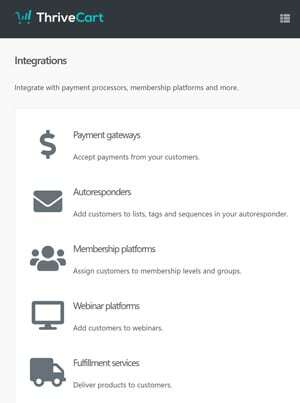 Payment processors, autoresponders, membership platforms, webinar platforms & more. The most important connection that your shopping cart will make is with the payment gateway… These are the people who actually run the transactions and charger clients. For me, I have Stripe, PayPal and Apple pay all tied in and they work flawlessly. With more and more traffic coming from mobile and more mobile users getting comfortable making payments through their cell phones, Apple pay has created a significant boost in my conversion rates and profits. Again, Thrive cart was a leader in the shopping cart world by adding on the Apple pay functionality very early. Additional payment gateways for Thrive that I'm not using are: Authorize.net, Android pay. As I mentioned above, this is one of the areas Thrive Cart excels. Personally I am using active campaign that directly receives tags from Thrive cart upon specific actions (new customer, failed payment, refund, cancel, etc.) And these tags run specific automations inside of activecampaign. All of the customers information, passwords, and access are controlled through active campaign. I then use ActiveMember360, a WordPress plug-in, to receive the member access information from active campaign and give members access to the appropriate content based on their purchase. They are eliminated and their account access is revoked. Personally, I hired Dave from IntegratePro.com to set this all up for me… He's awesome. I'm not an affiliate of his and I don't receive a kickback. Just a happy client of his who likes to spread the good word! If you run on WordPress , Thrive integrates directly with MemberPress, MemberMouse, and Wishlist. If you are on a stand alone course management or learning management system, it integrates with Kajabi and Teachable. Thrive integrates directly with these marketing automation solutions too. If you run webinars, Thrive integrates with Webinar Ninjas and Demio. Another example of how Thrive cart is truly a leader in the shopping cart software world, they integrate extremely well with multiple fulfillment systems and Shopify. With these two, you can use Thrive to sell a nearly infinite number of physical products. You can push all transactions that happen in your Thrive shopping cart directly into your Shopify store, seamlessly. If you are planning on going big with your Facebook advertising to a free plus shipping funnel. Is ThriveCart Right For You? And with so many software providers getting into the 'shopping cart' and 'sales funnel' game, the number of options you have available are staggering. Click here and get Thrivecart today before they switch from the lifetime license to a monthly pricing model! You'll save thousands over the life of your account this way! If you want to be able to A/B Split test your checkout pages and have full customization control click here and get Samcart. If you want the cheapest shopping cart for WordPress, go with the eStore plugin here. I'm happy to elaborate on anything covered here! One question: Isn't gumroad enough for selling digital products when they have the shopping cart built right in? Why to have a separate shopping cart? Their interface is terrible... and with an 8.5% transaction fee? That is just plain crazy. This is amazing content lol wow I’m in aww! So this is my first time hearing of thrivecart and I was actually considering switching to active campaign... im just a tad confused where you said you hosted your membership site ? ThriveCart is just a shopping cart... Active Campaign is an email autoresponder and marketing automation tool. I host the membership sites either on WordPress or on my private forum (XenForo)... They all integrate together to make the experience smooth for customers.